#ad - This post is sponsored by Saputo. The opinions on this blog, as always are my own. You can follow Ingredients by Saputo on Facebook, Instagram, and Pinterest for more recipe inspirations. Thanks for supporting brands that help keep me baking! Oh hey friends! 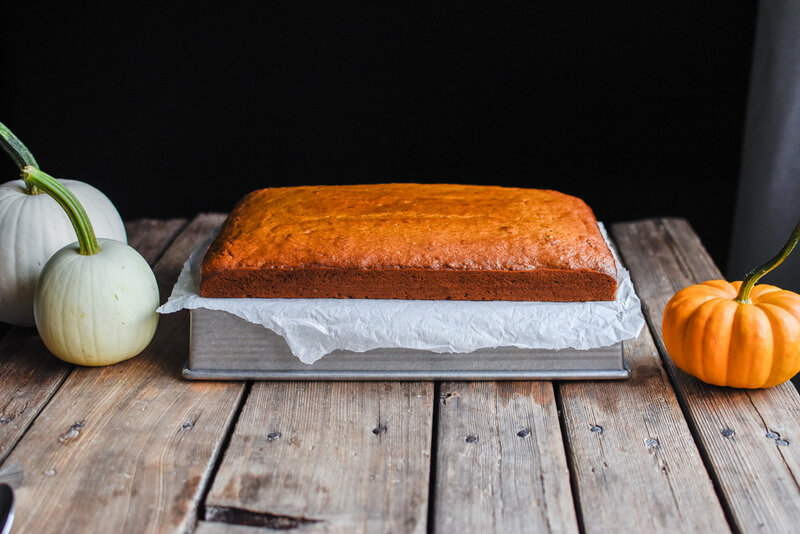 I am so so excited to be sharing this wonderfully simple pumpkin sheet cake with you today! It's completely no-fuss, and serves a crowd beautifully. The maple drizzle makes it look extra fancy, but it really is the easiest thing ever. I'd say that's a win win situation. Living on a pumpkin farm means that I have an abundance of pumpkins at my disposal, and I always end up making cake a few times during the Fall season. There’s something about pumpkins that is so magical, and the fact that you can bake with them is so fun! 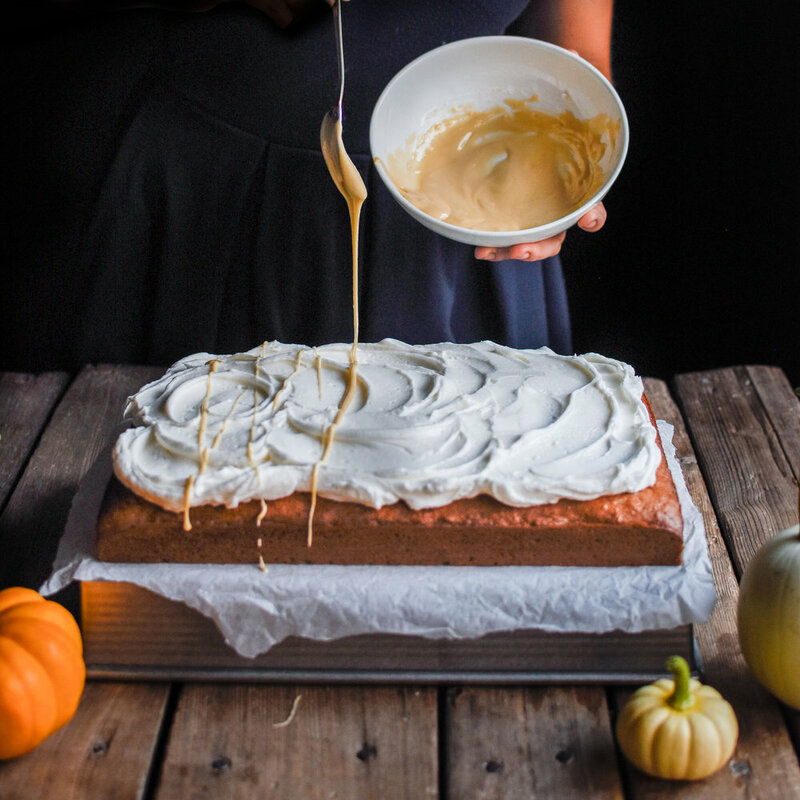 A dash of cinnamon and allspice complement the pumpkin flavour so well, and we top the cake with fluffy vanilla frosting, and finish it off with the maple drizzle. Simple decadence at its best. What also makes this recipe unique, is that it’s lactose free! I have a few friends who can’t have lactose, and it’s so perfect to have a few recipes up my sleeve that they can enjoy. I used Dairyland Plus TruTaste Lactose Free 1% Milk in the cake, and it worked perfectly. 2. Grease a 9”x13” pan with butter, and set aside. 3. In a large bowl, mix together oil, eggs, and brown sugar on medium speed until smooth. 4. Add in pureed pumpkin, milk, and vanilla extract, and mix on medium until smooth. 5. In a medium bowl, mix together flour, baking soda, baking powder, salt, ground cinnamon, and allspice. 6. Add dry ingredients to the wet, and mix on low, just until combined. Use a spatula to scrape down sides and bottom of the bowl to ensure everything is incorporated. 7. Pour batter into greased pan. Place into the oven. 8. Bake cake for 30-35 minutes, or until an inserted toothpick comes out clean. 10-15 minutes before removing carefully from pan, and allow to cool for another 20 minutes, or until it is cool to the touch. 10. While cake is cooling, prepare the frosting and maple drizzle. 11. In a medium bowl, combine shortening, powdered sugar, vanilla, and Dairyland Plus TruTaste Lactose Free 1% Milk. Mix together on medium speed until smooth and fluffy. Add more milk or powdered sugar if needed. 12. In a small bowl, combine maple syrup and powdered sugar. Whisk together until smooth. Adjust thickness until desired consistency is reached. 13. Use the frosting to frost the cake, and then drizzle with maple drizzle.